1. In a food processor, process blueberries, rum, lemon juice, garlic cloves, brown sugar, onion and white vinegar until smooth, stopping to scrape down sides. Pour mixture into large plastic freezer bag; add pork. Seal and chill at least 4 hours. 3. Grill pork, covered with grill lid, over medium heat (300° to 350°) 11 to 13 minutes on each side or until a meat thermometer inserted in thickest portion registers 155°. Remove from grill. Loosely cover pork with foil; let stand 10 minutes. 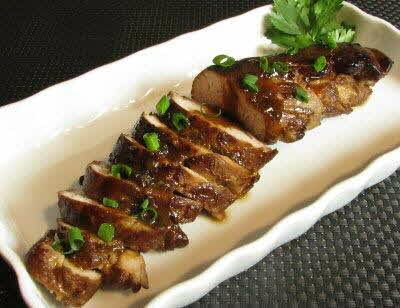 Cut pork into slices, and serve over toasted bread.